The charts below all shows the average of GISTemp and HadCRUT4 with the average of RSS and UAH. I've combined them, because the surface records are close to each other, and the satellite records are close to each other. The first chart (animated) shows the record from 1980 to 2015. Note the surface temps for last year are only averaged to November, and the December temperatures might change that a little bit. 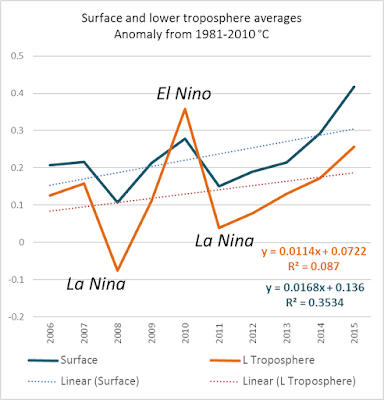 The second chart compares surface and lower troposphere up to 2006. I've marked the main ENSO events as well as Pinatubo. Although the linear trend lines are different, I'd say that's mainly because of the end points of each. The temperatures follow each other fairly well. The warming and cooling events are exaggerated in the lower troposphere compared to the surface, which is as expected. This last chart is for the period from 2006 onwards. It's only for a very short period, so I could be wrong, but it seems to me that there was a jump down in the temperatures of the lower troposphere compared to the surface and I cannot think why that would be. It's as if the lower troposphere dropped from the La Niñas and unlike in earlier periods, it didn't recover. There was strong La Niña in 2010/11 ("one of the strongest on record") and the Bureau of Meteorology reports La Niñas in 2007/08, 2008/09 and 2010-2012. Then there was an El Niño in 2009/10 which does show up in the chart, as well as one in 2006/07. So it could just be the preponderance of La Niña. The PDO index was negative from 2007 until 2014, but the AMO was positive over that time. I don't know what effect they have on the temperature of the lower troposphere. If anyone can explain the recent drop in the lower troposphere temperatures compared to the surface do tell. Why might it have become disconnected from the surface temperature? Was it just the preponderance of La Niñas? If so, why did it last so much longer than in earlier periods? I'd be particularly interested if you know of any papers on the subject - I couldn't find any. There's a paper from 2003, by Carl Mears (of RSS) and colleagues, which will give you an inkling of the difficulties in working out the temperature of the air at different levels. There's one more chart worth looking at in this context, which was prepared by Nick Stokes of Moyhu fame. What it shows are the different changes that have been made to GISTemp and the changes that have been made to UAH over different periods of time for the record from 1980 onwards. 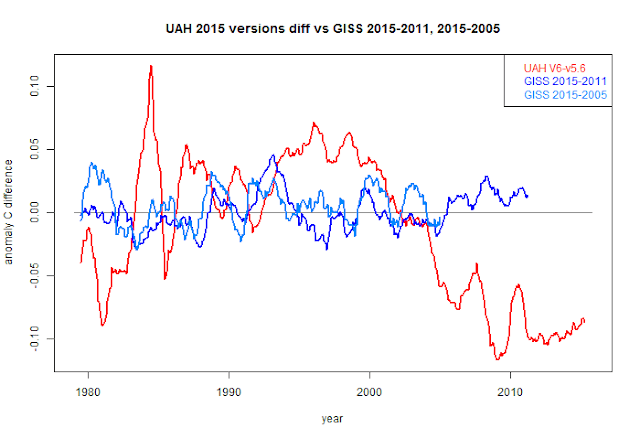 It shows the difference in GISTemp for two periods - 2015 minus 2011 and 2015 minus 2005; and for UAH it shows the current version beta 6 minus the previous version 5.6. The satellite data has had much bigger changes than GISTemp has. For months, reports have claimed 2015 was the hottest year on record, with temperatures reaching unprecedented levels globally. However, this title may have been awarded a little hastily after scientists in the US found evidence to suggest it was actually the third hottest year since records began. By studying satellite data, their results contradict the previous readings and predictions made using land-based weather stations. Well, looking at GISTemp, I make it eight of the ten hottest years since and including 2005, but I won't quibble too much. Here is a table showing how every year since and including 2001 are in the hottest 16 years on record. The only other year that made the grade was 1998. And we're only at 2015! 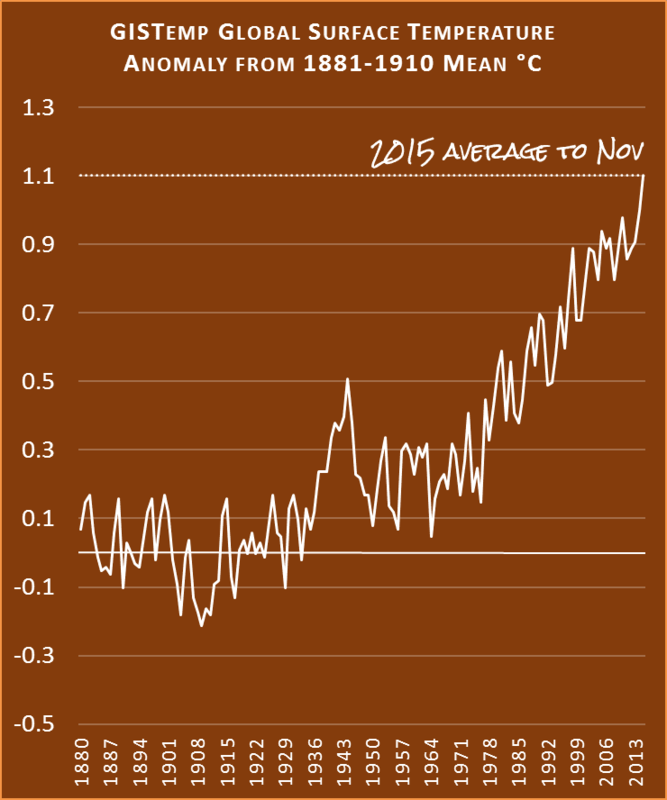 The world is getting hotter and hotter. Manchester United may have won 8 of their first ten matches but they lost their last game and they drew that other time so clearly they're in dire straits. ".. maybe you can tell me if I'm just suffering eye-ball-itis or if there could be something to it." - no need for antibiotics and I think we are looking at something fudged (rather trivial to understand the projections of climate revisionists - what they accuse others of doing they in fact do themselves. It is part of the pathology of right wing authoritarianism). I'm not saying it's fudged. Roy Spencer and John Christy wouldn't want to be shown up by outsiders yet again, after their previous ignominies. Carl Mears is not a denier and there's no reason to suspect him of doing anything wrong. What I'm wondering is if there is something overlooked in the treatment of satellite data or if it's a real difference. If the latter, I'm wondering what could have caused it. the 2010(?) paper on RSS parametric uncertainties showed just reasonable method variants using their approach yielded possible solutions that vary by c.01.K/decade (caveat emptor applies and yes, I should therefore know the year ...). Similar uncertainty pervades all tropospheric estimates (our 2010 WIRES piece is still reasonably up-to-date or see e.g. Haimberger et al., 2012). Also, don't forget the NOAA STAR MSU record which shows considerably more warming in TMT than either RSS or UAH (they don't produce TLT and for good reason - TLT has a negative weighting kernel portion which is physically impossible). Or the work of the University of Washington group. And unexpectedly, this puts to shame Ted Cruz' argument that the satellite records are considered more reliable. Thanks Peter for your very valuable input. Just to clarify I few things in what you wrote. First c.01.K/decade is supposed to mean, what? 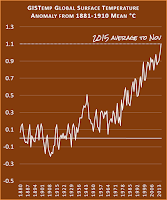 The uncertainty in the warming is 1K/decade? Or is it 0.01 K/decade? What the uncertainty in each data point? GISS usually gives a 1 sigma uncertainty for the annual temperature of 0.05C. How does that compare to RSS? Second, when you say that TLT has a negative kernel, you're referring to the kernel with respect to the radiation transfer equation which is an integral function? Does a negative kernel imply absorption? If it's negative, how does RSS explain their use of TLT? And finally, if I look up the absorption of microwaves in the 56-60 GHz range due to water vapor, it's quite substantial. Is this a significant problem in the measurements? If so, how does UAH or RSS account for the water vapor problem? Thanks! 1. Was a fat finger typo. The parametric uncertainty estimates are easily 0.1K/decade effect. Paper is here. RSS uncertainties are much broader than those for surface products as are radiosonde estimates. 2. The actual MSU / AMSU channels only have positive kernels but TLT is a combination of two channels. The combination is of the form 1.2*Ch2-0.2*Ch4 (for MSU, for AMSU with more channels the channel numbers are shifted (as are their frequencies slightly and therefore what they measure - the immediate effect is accounted for but the trend effect may lead to an error of 10% in itself). The recombination yields negative weighting kernels in the mid-to-upper stratospheric region. RSS for a long time refused to claculate a TLT product for this reason. Trouble is that without doing this you are stuck with TMT which has 10%+ weighting contribution from the stratosphere (which is cooling much faster than the troposphere is warming - and this is the part of the signal that makes clear its anthropogenically forced, a warming trop and cooling strat is a fingerprint of our effects). RSS reluctantly went down that path but they and UAH appear to be trying new, alternative approaches in developing new products. 3. The MSU is mainly outside that spectrum (50-58GHz). That range of the spectrum is almost uniquely determined by the vibration of Oxygen molecules with temperature dependence. The effects of water vapour are minimal but there is a scattering effect from water/ice droplets which means there is an issue in very heavily precipitating clouds. Spencer, R.W., J. R. Christy, Precision and Radiosonde Validation of Satellite Gridpoint Temperature Anomalies, Part II: A Tropospheric Retrieval and Trends during 1979-90., J. Climate 5, 858-866, 1992b. That algorithm excludes data from channels 5, 6,and 7 and only makes use that from 1,2,10 and 11 in order to correct the average of 3, 4, 8 and 9. While S & C have repeatedly claimed that their TLT represents coverage of the entire Earth, the fact that they use less than 30 percent of the actual area under the scan positions of each swath using this algorithm. They later published an algorithm for the AMSU, in which they again use only one channel, combining the data from each position in a much different fashion. See note 6 in: Christy et al. 2003, "Error Estimates of Version 5.0 of MSU–AMSU Bulk Atmospheric Temperatures", J. Atmos. & Ocean Tech, v20, 613. I have no clue what they did with more recent versions of their TLT thru v5.6. Version 6 utilizes a completely different approach, which has not yet been documented, as far as I am aware. Maybe I'm conflating more recent approaches here. The early TLT (maybe still) was indeed the difference between off-nadir scan angles. Whether you difference two channels or do the difference of off-nadir scan angles the end result is the same that the synthetic weighting kernel that results has a negative portion in regions of the stratosphere. Peter T. - You may have been thinking of Fu and Johanson's mid-troposphere time series, recently referred to as "T24" (on the RSS web site, it's called "TTT"). The weighting function utilizes channel 2 and 4 of the MSU and is computed from this equation: T24 = 1.1*T2 − 0.1*T4. Since you are a co-author for Mears 2011 paper, perhaps you can answer a question which has been bouncing around in my mind for quite a while. The emission weighting curves which have appeared in that report and many earlier ones are theoretical calculations. I would assume that they are based on an assumed temperature vs. pressure height, such as the US Standard Atmosphere. I would also assume that these calculated curves are the basis for the algorithms developed by Spencer & Christy and others. My question is: "If these weighting curves depend on a fixed temperature/pressure-height relationship, what happens in the real world with real profiles of temperature vs. pressure height?" I'm thinking specifically of the polar regions, where the pressure height of the tropopause changes considerably between seasons. If the algorithms are "tuned" to temperate latitude conditions, will they still function as desired to remove the stratospheric signal at other latitudes and seasons? 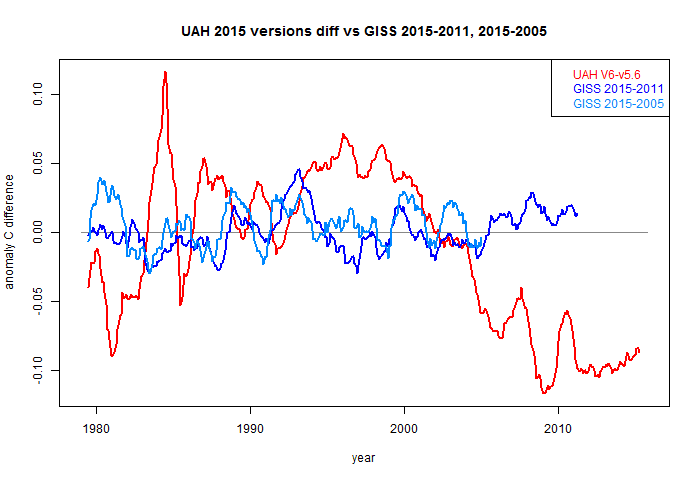 FWIW, the average temperature for the period from 2006 to 2015 for GisTemp/HadCRUT was 0.23 above the 1981-2010 mean and that for RSS/UAH was 0.14 above the mean, a difference of almost 0.1 C.
For the earlier period from 1980 to 2006 the average was -0.05 GISS/HadCRUT and -0.03 UAH/RSS, a difference of only 0.02 C.
The later period is much shorter, so the difference may reduce over time. Still, it seems quite a big difference - non-statistically speaking. "Dr Spencer is a proponent of natural causes as the man driver of climate change, rather than man-made causes, chiefly through the burning of fossil fuels"
Daily Mail... the "doubt" merchants are up to their usual tricks I see. Calibration issues? The 'shape' of the graphs look similar, they differ in magnitude. Tamino did a comparison with the RATPAC weather balloon data. Thanks, Hank. I don't know how I missed that article. The bottom chart on his blog article does look to have diverged somewhere in the early 2000s, though Tamino just says "This suggests that divergence starts even earlier" [than 2012]. Back when UAH was v5.6, it made it look as if RSS diverged around 2011, but now both RSS and UAH are so similar, it seems easier to spot when they became disconnected. There's bound to be a paper on this sooner or later. As can be seen, in the last 10 years or so the RSS temperatures have been cooling relative to the UAH temperatures (or UAH warming relative to RSS... same thing). The discrepancy is pretty substantial…since 1998, the divergence is over 50% of the long-term temperature trends seen in both datasets. Anyway, my UAH cohort and boss John Christy, who does the detailed matching between satellites, is pretty convinced that the RSS data is undergoing spurious cooling because RSS is still using the old NOAA-15 satellite which has a decaying orbit, to which they are then applying a diurnal cycle drift correction based upon a climate model, which does not quite match reality. We have not used NOAA-15 for trend information in years... we use the NASA Aqua AMSU, since that satellite carries extra fuel to maintain a precise orbit. It does appear RSS etc is a challenge. Maybe they will find the cause of the discrepancy, and release a new version of the estimated data sometime in the future. It is not the first time they have had to do this. metzomagic, Roy wrote that before the his team brought on their version 6 beta, when UAH was showing much higher temperaures and trend. Subsequently their v6 beta brought UAH into line with RSS. So which is right? Are RSS and UAH v6beta both wrong now? Did Roy Spencer and John Christy adjust their algorithm wrongly? Have they walked back from that article in public? UAH and RSS are almost identical now, by the way. See the comparison in this chart. Compare it with the previous version of UAH here, when it was quite a bit higher compared to RSS. What I don't like about the satellite TLT estimates is they are hard to compare with things that can be observed more directly. The surface temp is an estimate as well, but at least people and animals on the ground can tell if it is getting warmer or cooler. Especially using the ratio of new warm records being broken compared to cold records. The TLT is a sample of a large column of air which also includes clouds and convection. If, say, the lapse rate is changing it might confound the estimates. "Measurements of the temperature of the atmosphere made by satellites may be underestimating the global warming trend by as much as 30 per cent, according to research. Satellites measure atmospheric temperature using microwave sensors but rain-bearing clouds scatter microwaves and this has the effect of depressing the apparent atmospheric temperature, says Fuzhong Weng, a senior research scientist with the US National Oceanic and Atmospheric Administration (NOAA). This means that the global warming trend reported by satellites is too low and should be between 20 per cent and 30 per cent more, according to Weng, who is co-author of a paper on this subject published in the September 2014 edition of Climate Dynamics." If it was just UAH, I would be suspicious because of Spencer and Cristy's history of dishonest misrepresentation on blogs, media, and to Congress etc, but I have no reason to suspect Carl Mears and the RSS team are dishonest. The more I read about how complex it is to get any meaningful data from satellites about TLT, the more likely it seems to me that there could be impacts not taken into account properly. When are Spencer and Christy going to publish a new paper on their large changes from version 5.4 to 6.04? If warming of the planet causes the troposphere to expand upwards, do the altitudes that the satellites measure also need to change so that the measurements fully encompass the troposphere? I wondered that myself, Cabc. I'm also not sure whether they measure the lower troposphere by pressure or distance. Some of what I've read suggests it's height rather than pressure (though I can't be sure of that), which makes me wonder if they adjust the vertical height as they move toward the equator or not. I don't think the air cools evenly as you move up higher. I'm not just referring to the stratosphere/troposphere difference. The profile in the troposphere wiggles somewhat too, AFAIK. BTW - that came out a bit wrong. I'm not suggesting they don't know what they are doing, by any means. Just wondering what exactly is being measured for each of the different levels (lower troposphere, mid-troposphere etc) and how they manage to not let one level "contaminate" the others (eg stratosphere leaking into the troposphere). As far as I know the TLT measurements are synthesized from measurements collected from in effect the top of the atmosphere - the satellite sensors cannot tell from which altitude the microwaves came from, so they fit one bulk measurement to a computer model of the atmosphere. If the computer model is not accurate or needs adjusting... different result. The satellites measure signal strengths at several different frequencies from Oxygen molecules. They are affected by clouds. Some of the signal comes from reflections off the surface, so the albedo of the surface patch below matters. That means you need to know if you're looking at ocean, land, land that might be covered in snow, oceans and lakes that might be clear, or covered in ice, etc, etc. See all 3 levels of Skeptical Science writeup. @Harry, what's ironic from the crowd that claim the satellite data are the 'gold standard' and 'most reliable' is that they are usually the ones poo poo ing using models. Not even realising that the satellite data relies on modeling. Just another unjustified claim by the denier crowd. They are only interested in data that they think agrees with their narrative. Satellite microwave measurements do not look at the poles where the temperature anomalies are far larger with Global warming. Cowtan and Way were especially careful to account for even the paucity of ground level thermometer measurements. If I remember correctly they even accounted for land ice and water for the corrections they did for sparse data. It looks to me that there is a cumulative error from about 2000 on between the surface and satellite measurements. This could be a combination of poor coverage at the poles and previous attempts at formulating an algorithm that converts measuring a column of air microwave emission and temperature somewhere on this column to match ground measurements. As a former pilot I can tell you that rising thermals that eagles, hawks and glider pilots use would not exist if even a few thousand feet above ground level air was not cooler than ground level. My line when they fetishize satellite temps usually includes something about living in a dirigible. I'm not sure to what extent it applies to RSS. It applies directly to RSS, that is what Richard Eric Swanson was talking about. UAH and RSS are derived from more or less the same microwave sounding data collected by satellites. So why do we cede any ground to satellite data arguments at all? Part of the problem with the satellite data is that there are two different instruments, the MSU and the later AMSU, and the later AMSU is processed with a different algorithm than the earlier MSU. RSS began using S & C's MSU algorithm, in an effort to verify the other processing which merged the different data sets from several satellites. Later, UAH began to include the AMSU with their new algorithm, which was necessary because the AMSU operates on slightly different microwave frequencies and has more scan positions in each swath across the satellite ground track. I'm not sure what RSS does with the AMSU data, but in each case, the trends appear to change around the date for the introduction of the AMSU data. The UAH version 6 uses an entirely different approach to processing the satellite data, mixing measurements from 3 different frequencies to compensate for the stratospheric contamination claimed for the MSU channel 2. UAH v6 is still a "beta" product, since S & C haven't published their work as far as I know. It seems rather strange to me that V6 is close to the RSS results, since RSS excludes data over the Antarctic and high elevations. The newest work from Po-Chedley, called "T24", appears to be different than UAH v6. "Wrong" is probably too strong a word. But the satellite measurements have issues, so the deniers cannot claim they are superior to surface estimates. I took him to be talking about an update to that paper. My apologies, I thought it was new because I did not remember the strong statements about the trends even being equal for both periods, but it is even in the abstract. Should have checked the paper. No problem Victor... eventually he will update.I think the data is on his website if somebody wants to graph it. About that tropical "hot spot" - this one refers to other papers as well, and my take is correct as confirmed by Steve Sherwood (and Peter Thorne). 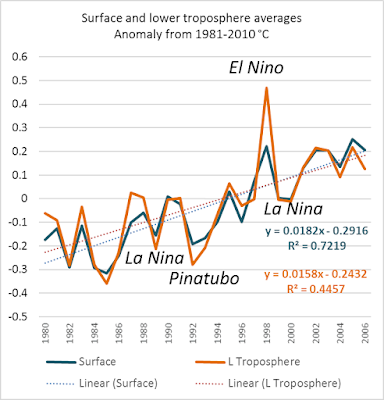 Given that the tropospheric temperatures respond stronger to ENSO it makes sense that the statistically non-significant trend change over the cherry picked period since 1998 is larger for the troposphere than for the surface air temperature. Part of the deviation for the recent period may thus be real and due to ENSO. That is likely not all, there is also the difference in the longer term trend for the satellite period. The spatial pattern is important here. As far as I know the long-term trend of the satellite estimates fits to the station estimates outside of the tropics. The differences are in the tropics. The satellites and some radiosonde dataset do not see the tropical hotspot. Given the various lines of evidence, I feel it is more likely that we will discover additional problems with the satellite estimates in the tropics. Given that the difference is mainly due to the missing tropic hotspot in the satellite temperature trend, it seems more likely than not that there is some problem with the satellite trends. 5) it is seen in climate models. All 5 pieces of evidence have their caveats. Individually they are not strong, but in combination they are a lot stronger. But we will only know this with confidence when we find the reason for the problem with the satellite trends and some radiosonde datasets or when we find problems with all of the other 5 pieces of evidence against it. A big problem is that the tropospheric temperatures are important in the climate "debate", but are scientifically not important. There are no users for tropospheric temperatures, not many people live up there, that demand better data. Because the most likely resolution of the discrepancies is that there is an error in the processing of the satellite data, which a a-priory buggy, there is very likely no scientific improvement in our understanding of the climate system. That means that it is difficult to get funding to study this. Funding depends on prospects for scientific progress. Because the most likely resolution of the discrepancies is that there is an error in the processing of the satellite data, which a a-priory buggy, there is very likely no scientific improvement in our understanding of the climate system. This not-a-scientist is leaning that way too. With all of the ground-based thermometer records, that are in accord (except for HADCrut, which I believe has spurious arctic coverage compared to the others, though I may be wrong about that), telling us pretty much all we need to know, what extra knowledge/skill do the satellite records contribute? There is only limited funding for science, so you have to pick your battles. I completely agree with Victor, that disagreement between the satellite temperature models and other evidence is more likely to indicate problems in the satellite models than the other way around. RSS created a multi-channel product called TTT (temperature total troposphere) to adjust for suspected contamination of the TMT data from the stratosphere. Given the satellites provide no data past 82 degrees north or south, the polar temperatures are simulated by UAH and RSS respectively -what difference does this make to their models? If UAH's version 6.0 really is more sensitive to ENSO than previous versions, then the clock is ticking for the "there's no recent warming because the only real temperature data is the data that shows there's no recent warming" argument. 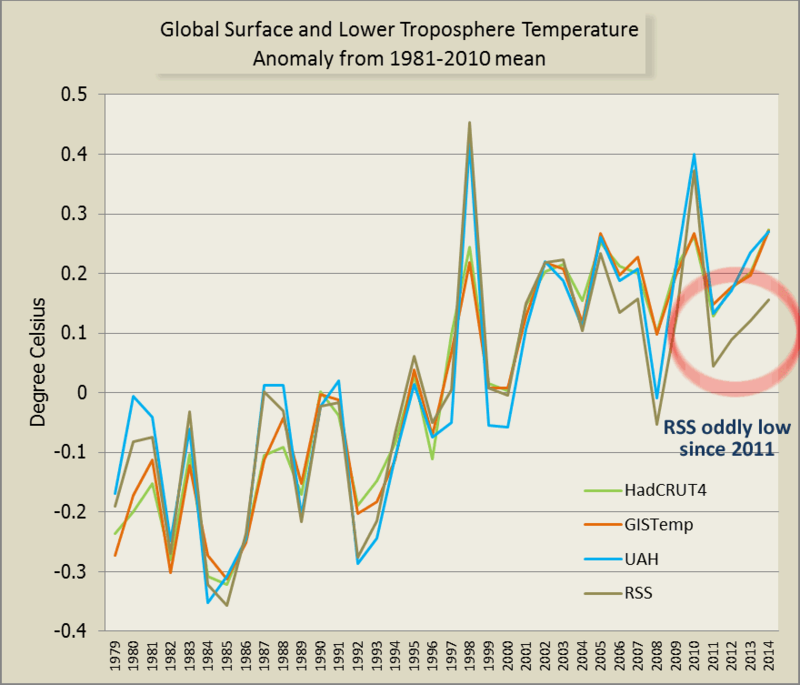 2016 ought to stand out as a record breaker in the satellite models...which is doubtless why the more far-sighted in the AGW countermovement are already trying to make out that comparing global climate models and satellite data before 2016 is more important than looking at the actual temperatures (this was Christy/Curry/Happer's argument when they testified for Ted Cruz in December). According to both the UAH team and the RSS team they both use the AMSU data to calculate the lower troposphere results. In particular they both state they use AMSU channel 5 as part of their algorithms. AMSU channel 5 failed in 2013. AMSU Channel 4 failed in 2008 and the sea surface reordings (I'm asuming channel 2/3) haven't been updated since 2003. Check the GHRC AMSU page to see where the data failed. Nothing below 7.25km is being recorded reliably at the moment according to the NASA site. Which seems like most if not all of the TLT measurements. If this is correct, what are UAH & RSS reporting currently? Do they have alternate sattelite input? The list of satellites used in the upper atmosphere for RSS are listed on the RSS website. The lower troposphere ones are on the far left (TLT). From this I get that all other satellites use channel 2. However, looking at the GHRC page, I don't see any input from these other satellites for TLT. Perhaps GHRC does not use these other satellites. What is the GHRC page, Chuck? You live in a 3-story house plus basement and attic, and you have recording thermometers around the house. While temperatures differ, especially in the cooler attic and basement, each thermometer is pretty reliable in measuring *changes* in temperature in its own spot. With jiggles, they show a clear rising trend, because in fact your thermostat is broken and ratcheting the temperature up, and the fastest rises are in attic and basement. Every day, a few drones whiz around the house bobbing up and down to cover the 3 stories (not attic or basement), and they drift so they don’t always follow the same path. They each carry an infrared thermometer aimed towards the house, although brands differ, and the drones only last so long and get replaced with different ones. The time of day matters, as do conditions like fog or rain. Some parts of the house are better insulated, and windows are different, and sometimes blinds are down and that matters. So, all this tells you something about what’s going on *around* your house … but do you think it’s more reliable than real thermometers where you actually live inside? "...in some cases using secret algorithms that keep changing, and have been shown to have bugs (like mixing up + and -)"
I know nothing about inferred measurements from satellites or real time measurements from radiosondes but as an interested member of the GP it seems to me that we need an expensive global radiosonde project for say (I dunno) a six month period that somehow incorporates part of an ENSO event and in which major government and private institutions pepper the troposphere with a statistically relevant number of instruments in those latitudes covered by the satellites. 2. Completely deal them out of the pack. In one sense yes--ENSO's tend to have more CO2 evulsion from the oceans. I have been backtracking origins of common memes. Let us recall where and when the “satellites are more accurate” meme started, i.e., part of SkS#38 in fixed list. Scientific Perspectives on the Greenhouse Problem. Cheap, basically for shipping. Everybody should have one. If those names are unfamiliar, read Merchants of Doubt(2010). This is an old, old meme, pushed relentlessly Msrshall Inst, Fred Singer, Heartland Environment and Climate News ... since 1990. Yes, indeed, have seen it 3 times, strongly recommended. Umm, just wondering, and this is grade 10 chemistry, but: if the earth is heating up, then the atmosphere close to the earth is warming up somewhat. As gasses expand with heat, would that effect the size/shape of the troposhere, at least few metres here or there? Would that affect the results of the satellites and the calculations therein? A few meters here or there won't do anything important with the calculations. The extreme response to ENSO (El Nino, La Nina) suggests there is something with water vapor/clouds. Everyone interested in this topiuc should; read Kevin Cowtan's new post. Click on the flowchart that explains the satellite analysis algorithms. UAH version 5.6 "is far closer to the surface measures than it is to V6 (or RSS)." Yes Mark. They were all very close (satellite and surface) until recently. RSS split off from the others noticeably from around 2011, and actually probably a few years before that. That still left UAH and surface very similar. Then UAH adopted v6Beta which made UAH more like RSS for the global aggregate for the lower troposphere. So now it's surface vs UAH and RSS, but that's only for the last few years. They are very similar up until around 2005-06. Stephen Po-Chedley, Tyler J. Thorsen, and Qiang Fu, 2015: Removing Diurnal Cycle Contamination in Satellite-Derived Tropospheric Temperatures: Understanding Tropical Tropospheric Trend Discrepancies. J. Climate, 28, 2274–2290.